Pictures and rumors of FLEPia, a color ebook mady by Fujitsu, have been floating around the web for around 2 years now. Last October, we saw a working prototype during the CEATEC electronics exhibition in Chiba, Japan and were impressed. Today, half a year later, Fujitsu announced the release date in Japan and price for the device (press release in English). And it turns out to be a very expensive piece of hardware. The world’s first color e-paper mobile terminal, as the FLEPia is called by Fujitsu, will carry a price tag of around $1,000. 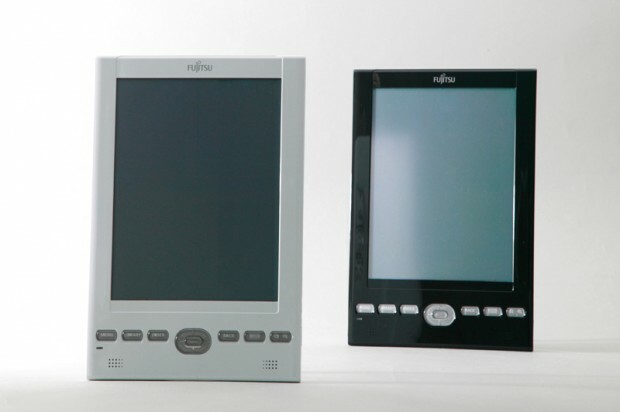 It’s going to be released in Japan on April 20 (in white and black), but Fujitsu hasn’t said anything yet about bringing the FLEPia to other markets as well. The e-book features an 8-inch XGA touchscreen (260,000 colors), 4GB memory via SD card(storing the equivalent of 5,000 paper-based books), Bluetooth 2.0+EDR, WiFi, and a USB port. Fujitsu promises a battery lifespan of around 40 hours. The Japanese version of the FLEPia is equipped with Windows CE 5.0 so you can work with MS Office documents (Fujitsu explicitly states this is a Japan-only OS). The FLEPia is sized at 158mm×240mm× 12.5mm (thinnest section: 11.3mm, weight: 385g), while the Kindle 2 measures 203mmx135mmx9mm and weighs 290g (screen size: 6 inches). Fujitsu hopes to sell 50,000 units by 2010.